Also about Genjitsushugisa no Oukoku Kaizouki. Although the WN had been deleted but I will still translating it. After all, it is one of my favorite novel. I had saved all the RAW chapters…. So no need to worry…. Two days have gone by since Kevin, the peddler, left. Yuuji and Kotarou were at a place outside the house where they could still see the house hedges. Yuuji called towards the direction of the house, which was followed by an energetic reply from Alice. *nsho*nsho* Alice’s voice could be heard, and a moment later some water spouted out, drawing a parabolic arc over the hedge. While muttering, he tied a climbing rope to the trees as a mark. From inside the house, Alice’s voice could be heard saying *nsho*nsho*, as she climbed down from the stepladder. The water hose she held in her hand still speraying water. Yes, Yuuji was aiming towards self-sufficiency, and first he intended to cultivate the land where the water from the house could reach. With the climbing rope tied in each direction of the house, Yuuji decided that this would be the area where he would start cultivating the land. By the way, the area size in the north was narrow. He didn’t want to cut down the tree in that area. If it was possible he thought about cultivating edible mushroom there. Towards Yuuji who was asking for too much, *woof* Kotarou barked softly. She seemed say as if to cheer him up. While pettng Kotarou’s head, Yuuji said “Oh, I understand Kotarou, I will do my best”. Alice who had been tasked with sprinkling water, trotted towards Yuuji. While saying, “Then we need to find something that Alice can do”, Yuuji put down the tools that had been prepared to open the land for the cultivation on the ground. The tools from the house included a saw, hatchet, hedge clipper, tree pruner, pruning shears, shovel, climbing rope, pick axe, and working gloves. And the tools that Kevin gave to him were various sized of hoes and hatchets. Maybe because he was happy with Alice’s assertion to help, Yuuji was chopping down the trees in high spirit. By the way, he couldn’t cut the tree easily. After all, there was no chainsaw in this world. Since Kotarou saw that the discussion had finished, she quickly ran to look at the surroundings. Perhaps because she was thinking, ‘maybe I could catch a dinner’, she was drooling more than usual. What a shameless girl. First of all Yuuji used the saw to make directional notches. Because if he failed to do this, he wouldn’t know which the direction of the tree will fall, he carefully deepened the saw blade. By the way, yesterday, when he typed “Umm, can’t we just strike it with axe repeatedly?”, he received the indignation from the bulletin board residents. Although he was unreliable, since he consulted beforehand, he might made progress from what the net had investigated. Moreover, although the bulletin board first proposed to fell the tree with the saw cutting towards to the directional notches, since they didn’t know the performance of this world saw, they temporarily put this on hold. In case the saws didn’t exists in this world or the material composition was inferior, then it better to not damage the saw from Japan when using it. That’s why, it was important to be careful when using the saw to make the directional notches, then the next step of cutting towards to directional notches would be performed using an axe. If we are talking about cutting down a tree then it won’t do if we left out the song, so Yuuji started to sing. Of course, Alice didn’t give any interruption. She just stood back beside the hedge and stared blankly at Yuuji while looking puzzled. From the forest one could hear the echoes from Yuuji’s song, accompanied by the chopping sound from the axe striking the wood. At last, the first tree fell strikingly. Because he was gushing a great deal of sweat, Yuuji wiped his drenched forehead with his sleeve. By the way, the work took almost one hour. Although, it was natural for him to meet difficulty on his first try, but for the planned land cultivation, there was still a lot left to do. With hatchet in their hand, both of them started stripping the trunk from the branches. Sometimes, there were sounds of Alice yelling, “Humph, ei!”. When Yuuji had finished cutting the fallen tree, which had been deprived of its branches, into a size that could be carried by his increased physical power, the sun was already slanting in the western sky. “Alright, with this, it’s okay!” Yuuji exchanged high fives with Alice, then they heard rustling sound when Kotarou returned. She was holding a mountain bird in her mouth. While putting today’s harvest near her feet, Kotarou looked at the two that were happy from chopping down just one tree. Yuuji, who was called by the first adult person that he met in this other world as a “Forest Magician-dono”, changed his job from “NEET” to “Magician of the Forest”. Possessing the promise with the peddler, he began developing the land to aim for self-sufficiency; all for the sake of stable living. 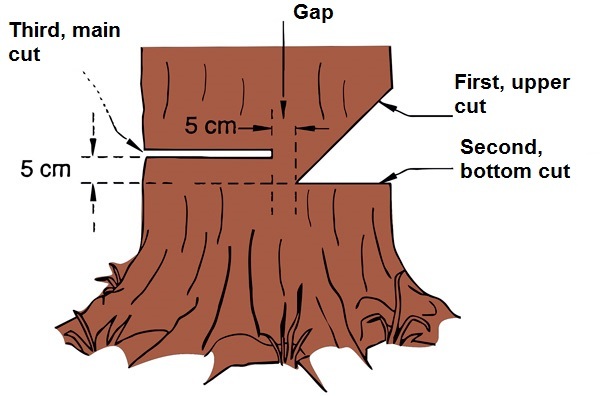 To translate this part I need to read http://www.husqvarna.com/ca/en/support/working-with-chainsaws/directional-felling/ see picture below, the “notches” is the < gap located on the right. What it means was cutting horizontally. Make a “Main Cut”. Sometime I forgot that Yuuji too had leveled up. Why the sudden detele of WN? As someone who's used a chainsaw to fell trees, I hope Yuuji didn't try to fell a really thick tree with the axe, because that would require much effort. Also, did he sing the Monty Python 'I'm a lumberjack' song or which? Magician(lol) of the Forest indeed. Still, thanks to those level ups he's able to fell a tree, so some manner of magic was involved, right? Thanks for the hard work as always! Thank so much for all your hard work!!! the job will get harder too..
"Umm, can’t we just strike it with axe repeatedly?" Sweet jesus no. If the tree is too large or leaning it can cause disaster. Barberchairing is not funny. Reread! And what can that song be?